When I had Kim over for dinner this week, I of course HAD to have some kind of dessert ready. I decided to check out one of my favorite blogs Love and Lemons, and I took this straight from the blog. 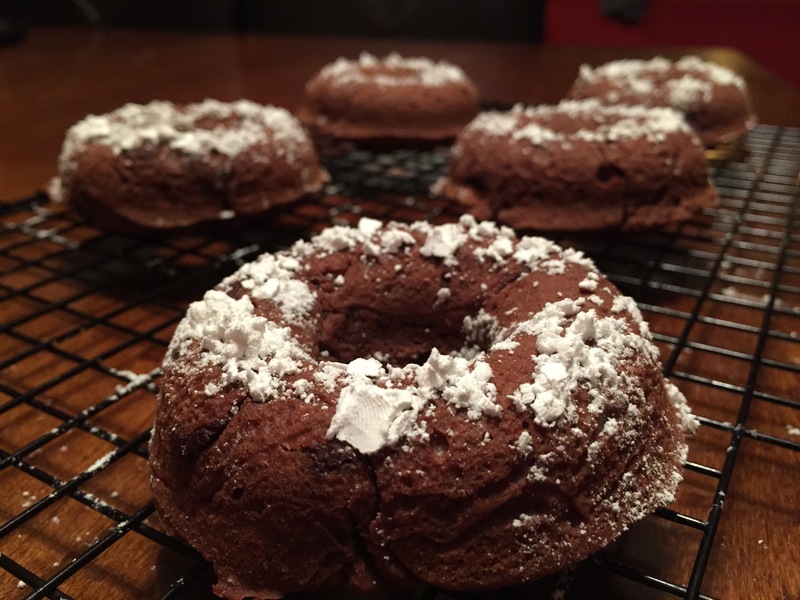 These were perfect caked donuts, but very cakey, so you may try using a little less flour. I also threw in some chocolate chips (as I always do), because chocolate makes everything better! And let me tell you – we were wishing we had some vanilla ice cream to go along with these little guys!!! Right out of the oven, warm with ice cream – just SHUT UP. Perfect for breakfast, dessert or a snack! The spices really give these a nice fall flavor too. makes about 24 mini doughnuts, 16 mini-muffins, or about 8 regular sized doughnuts. Preheat oven to 400 and spray or grease a donut pan or mini-muffin pan. Sift flour, cocoa powder, baking powder and baking soda. Stir in the rest of the dry ingredients. In a separate bowl, whisk all wet ingredients. (if your coconut oil is clumpy, melt it slightly). Combine wet and dry ingredients, stirring gently until just combined. Fill doughnut pan, (don’t fill batter higher than 3/4 of the way up). Bake for 5-7 minutes (possibly a bit longer if you are not using a regular sized doughnut pan). Doughnuts are done when they are puffed up in the oven. Be careful not to over-bake, especially if you’re making mini’s. They bake quick.